Description: Products Produced: 50% formaldehyde with 0.7% Methanol and 0.010 PPM Formic Acid. Dilution to other concentrations is possible. Raw Materials: Methanol (100%) 1.19 pounds of methanol to produce 1.0 pound of formaldehyde. 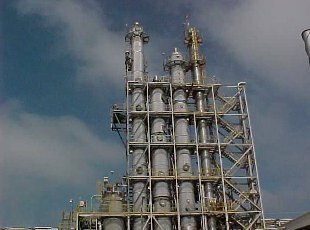 Major Upgrades: Took place in in 1997, and a new distillation column and saturator column, and replacing sections of the absorption columns (to allow for higher throughput). Built: 1987 Start up of production was in the first quarter 1988. Capacity: 50,000+ Metric Tons/Year. The plant ran for upto six consecutive months before the catalyst charge needed replacement. A high monthly production rate, (highest monthly production rate demonstrated was 4,189 MT) and a conversion factor methanol to formaldehyde above. Industrial standard proves that this plant met requirements for reliability and cost efficient operation.